Geneva - U.S.-backed Saudi Coalition’s targeting of a bus carrying children in Yemen’s Saada Governorate is extremely alarming, says the Euro-Mediterranean Human Rights Monitor, expressing grief for the killing of 39 civilians, most of whom were children, and injuring 51 others. The Coalition’s excuse for this atrocious crime is that Houthi members fired missiles at Saudi areas, a pretext that could be described as a sheer disregard for human life. The airstrike targeted the Dahyan market in Saada Governorate, a civilian area located to the northwest of Sanaa. The Coalition forces never stated whether the strike killed any of the Houthi militia members, while the wounded were taken to an ICRC-supported hospital in Yemen. The airstrike was only stated as a response to a ballistic missile fired by the Houthi group at an area to the South of Saudi Arabia. Although Col. Turki al-Malki, spokesman for the Coalition, did not deny responsibility for the attack, yet he justified it by stating that Houthi members either recruit civilians or use them as human shields. This justification shows utter recklessness towards civilians on the Coalition’s part, stated Sarah Pritchett, Euro-Med’s spokeswoman. Under International Humanitarian Law (IHL), even if the Houthi group used civilians as human shields, added Pritchett, there is nothing that would justify targeting such a high number of children and civilians under these circumstances. IHL states that parties to a conflict should take into account the principle of proportionality when launching an attack. It further prohibits attacks against military objectives that are “expected to cause incidental loss of civilian life…, which would be excessive in relation to the concrete and direct military advantage anticipated." When targeting Houthi sites, the Coalition is not relieved from the responsibility to avoid civilian losses. Placing military targets near civilian areas is no excuse either for this massacre. 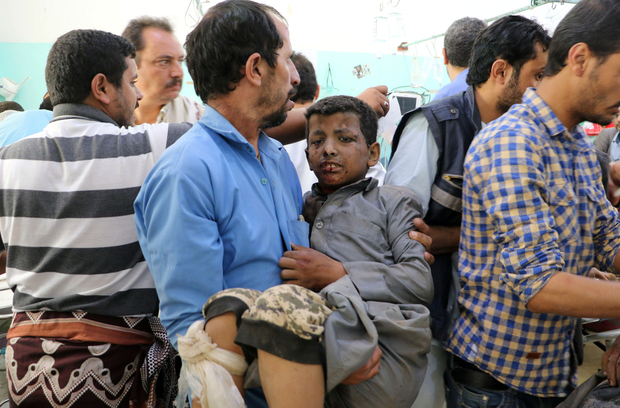 Almost 1,400 children were killed since the beginning of the conflict in Yemen in March 2015. The United Arab Emirates and Saudi Arabia are responsible for the killing of 60% of them, according to the United Nations. In addition, over 2,140 children were wounded, and 1,700 recruited, Euro-Med Monitor further added. The Euro-Mediterranean Human Rights Monitor calls on the international community to establish an international commission of inquiry to investigate war crimes committed against civilians in Yemen so that perpetrators are referred to the International Criminal Court (ICC). Euro-Med Monitor further calls on the parties to the conflict in Yemen to spare civilians the repercussion of the three-year-long conflict, to adhere to the dictates of international humanitarian law, and to put a prompt end to the grave violations against civilians in the country.